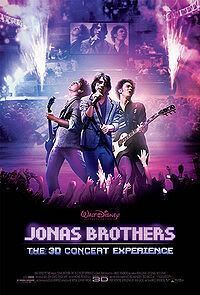 Jonas Brothers: The 3D Concert Experience (also known as Jonas Brothers: Burning Up Concert, or Jonas Brothers: The 3D Burning Up Concert Experience) is a 2009 American concert film from Walt Disney Pictures presented in Disney Digital 3-D and IMAX 3D. It was released in the U.S., Canada and Puerto Rico on February 27, 2009 with the release in other countries later on. The film is rated G by the MPAA. The film shows the Jonas Brothers during their Burning Up Concert Tour. It features concert performances, as well as documentary footage on the lives of the three brothers. This film will also feature a previously unreleased song called "Love is on its Way", and "I'm Gonna Getcha Good! ", a cover of Shania Twain's song. "Intro/Opening Credits (Tonight played in background)"
#"Tonight (studio version, played in montage with credits and movie clips of the concert performance of Tonight)"
#"Love Is on Its Way"
A music video for the song will be shown during the middle of the movie. The film's soundtrack was released on February 24th, just three days before the film's theatrical release. "That's Just the Way We Roll (Live)"
Jonas Brothers: The 3D Concert Experience is completed and its theatrical release started on February 27, 2009. It is Disney's first Disney Digital 3-D release to also be presented in IMAX 3D.